sailboat. 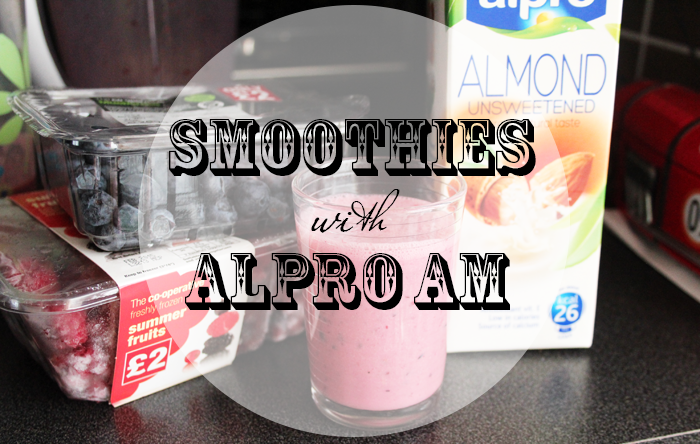 : Smoothies with Alpro! Almost everything I needed to get started arrived in a very intriguing looking box one morning and I promptly began looking for recipes to get inspired. I have to admit I wasn't very adventurous and I mostly stuck to just using fruits. I wouldn't describe myself as particularly fussy but I am sometimes reluctant to try things even though I'll most likely end up liking them in the end. My favourite combination so far has been strawberry, apple and blueberry and I was pleasantly surprised by how nice carrot and apple tasted. It was insanely bright orange but thankfully the apple stopped the carrot being too overpowering flavour wise. I'm really surprised by how quickly making a smoothie each morning has become a part of my routine. The Heston Blumenthal Juicer* is really good. It's so simple to use and most importantly, it's easy to clean. Admittedly I do still think gathering all the ingredients together each morning is a little bit of a faff and sometimes I would still much prefer to have that extra 10 minutes in bed, but I feel SO much better and I'm no longer a grumpy monster come mid-morning! Maybe I'll even start being a little more adventurous with the combinations I try...maybe! Any favourite recipes I should try? P.S. This is not a sponsored post. Alpro very kindly gifted me with the things I needed to get started but I'm not being paid to write this! I have become SO obsessed with smoothies, Sainsburies sell frozen smoothie packs which help with price costs to! I always have mine before bed but I really think that having it in the morning would be loads better! 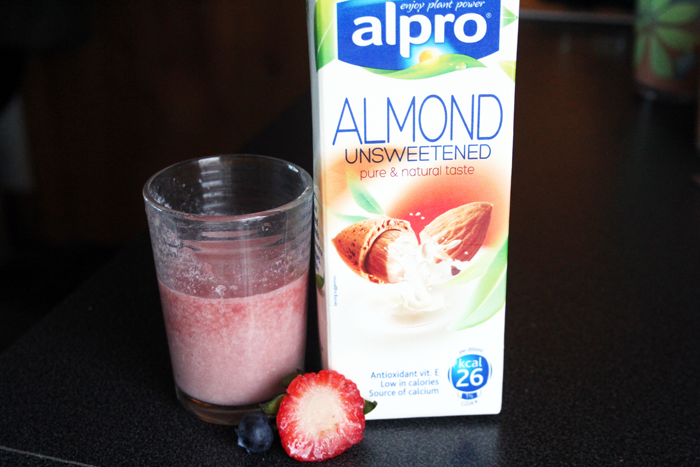 i looove homemade smoothies and am a big fan of adding alpro almond milk :) SO GOOD! My mum got a juicer last week and I'm going mad with collecting smoothie, juice and shake recipes to create. I think right now it's more a novelty but I'm going to be ever so grateful for it in summer, when all it takes is the twist of a button to create a refreshing fruit smoothie for the day! The carrot smoothie sounds intriguing, might have a go at that! I normally use a banana, and a couple spoonfuls of oats for my base with almond milk and whatever berries I'm feeling at the time, frozen blueberries, raspberries, strawberries or mango normally. In the summer I have smoothies every day because you just scoop everything in the blender and good to go. I'm not as big a fan of them in the winter though. 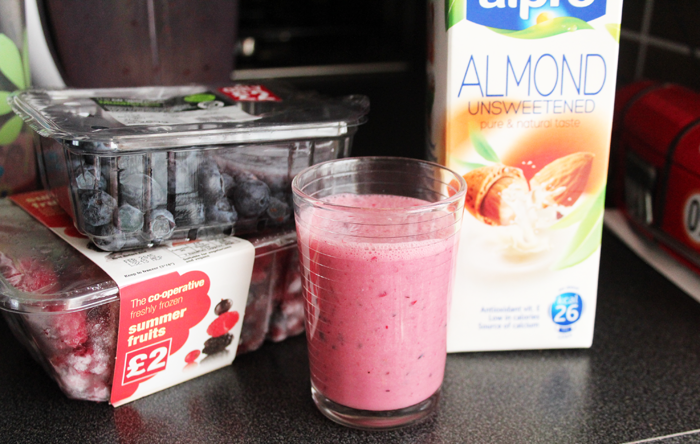 These smoothies look lovely, I have never had almond milk before but I really want to try it! 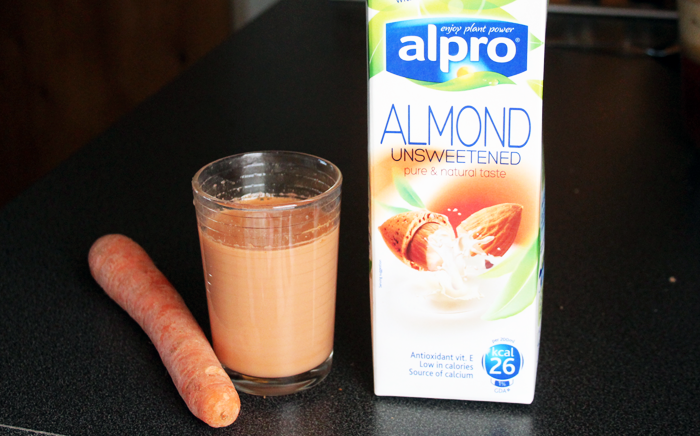 Since becoming Vegan I use Alpro quite a lot & I love using it in Smoothies, I don't mind the taste & have become quite used to it now. I have a smoothie almost everyday. Its a good way getting your daily dose of fruit. What a fun thing to be part of. Mmm...makes me want to go make smoothie straight away! I am vegetarian and I LOVE Alpro Soya Milk. YUM! Not a bad idea! I have a juicer which I love but I can never be bothered to clean the thing! So I get obsessed with it and then ignore it for ages. It doesn't help that I have a housemate who often leaves her things piled up overnight in the sink, so that when I want to use the juicer I can't be bothered to clear out all her stuff to use it. I love smoothies! I'm usually pretty tired in the morning, so I tend to buy pre-made smoothies that I can drink on my way to class or work. The raspberry/blueberry one looks so delicious! I really should start making my own…. I was eyeing up that juicer recently! I usually save smoothies for post-gym, and chuck in frozen fruit--sometimes blueberries, sometimes mango chunks--whey protein, and a heaped spoonful of greens powder. If I had a juicer I'd probably be more inclined to add veggie juices, but for the moment my tub of greens is rather handy. I've tried Almond milk and it wasn't to my taste, it was far too sweet for me but I absolutely love almonds! I switched to Soya milk not long ago and it's so much creamier and tastier than dairy I find. I never used to eat breakfast but now I go to bed at night dreaming of my 3 wheetabix smothered in golden syrup (not the healthiest haha). I'd love to try smoothies more but like you said it's a bit of a fuss of a morning but I really want to give it more of a whirl as I love innocent smoothies and those are very pricey! I've been a little sceptical about almond milk! Maybe with a smoothie it'll change my mind! Definitely thinking of giving it a try! I'm really boring when it comes to smoothies as well haha!